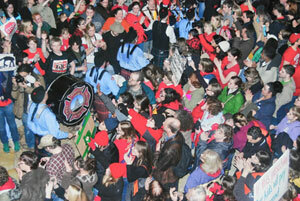 The people’s liberation of the state Capitol in Madison, Wis., is in full swing. Speaking to a massive rally on Feb. 19, Mahlon Mitchell of the Professional Firefighters of Wisconsin said, “Now is the time. We can’t let this die because we are at ground zero and what happens here affects the rest of the world. We have to be strong. A united front.” Mitchell in January became the first African-American president of the PFW. This was the biggest demonstration yet, with an estimated crowd of 100,000. It filled the grounds outside the state Capitol while a sit-in continued inside. A massive roving picket line with all sectors of the working class — union and non-union workers, the unemployed, students, people of color, immigrants, and the lesbian, gay, bisexual, transgender and queer community — marched on the streets for the entire day, accompanied by drumming, chanting, dancing and singing. The racist, anti-worker Tea Party hosted a counter-rally on the Capitol steps in the early afternoon. It drew about 2,000, protected by more than 500 fully armed cops with riot gear. Tea Party members were bused in and left quickly after their rally. The right-wingers were completely surrounded by the pro-union crowd. Some workers even waded into the Tea Party crowd and shouted at the main speakers. Gov. Scott Walker’s “budget repair” bill would eliminate collective bargaining rights for 175,000 public sector union workers statewide. Since Feb. 14 tens of thousands have been occupying the state Capitol to block passage of this legislation, which is an attack on the entire working class and oppressed by the banks, corporations and the Pentagon. Their pressure caused Democratic legislators to leave the state, thus delaying a vote and giving the workers more time to organize the massive protests. Beginning Feb. 15 the Wisconsin State AFL-CIO, the Wisconsin Education Association Council, American Federation of Teachers-Wisconsin, American Federation of State, County and Municipal Employees, and other unions began busing in thousands of members from across the state and beyond. Delegations of union members, students and community groups came from across the country and even from Toronto. Emergency support demonstrations by the Bail Out the People Movement began Feb.18 at the Stock Exchange on Wall Street and have continued across the world. Walker and state legislators have been flooded with emails, phone calls, tweets and thousands of visits to their offices. Virtually all the major unions have frequent updates on their websites. Facebook is ablaze with up-to-the-minute messages. Twitter updates are constant. Demonstrators utilize numerous other communication strategies, including a live stream from inside the Capitol. During the past week union members and their allies picketed the homes of Walker and other right-wing, racist politicians, held protests throughout the state, sponsored candlelight vigils and more. These and many other actions are ongoing. 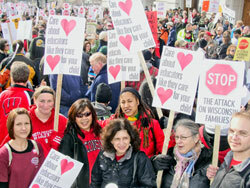 On Feb. 18, AFL-CIO President Richard Trumka spoke at a major noon-time rally and the Rev. Jesse Jackson Jr. spoke at an evening rally on the Capitol steps. Both expressed their solidarity and pledged to help kill the Walker bill. Rev. Jackson also put forward a people’s program demanding a moratorium on foreclosures, relief for student loan debt, and a federal jobs program, among other issues. He also pledged solidarity with the lesbian, gay, bi, trans and queer community. Students of all nationalities were the spark behind occupying the Capitol. 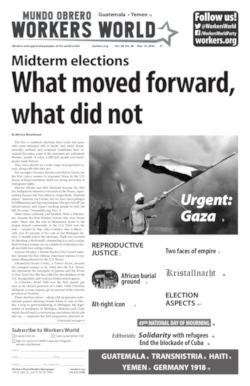 It began with a rally at the University of Wisconsin-Madison on Feb. 14, followed by a march and then the sit-in. Students soon took over and held the Rotunda, keeping up a spirited atmosphere with chanting, drumming, dancing and coordinated speak-outs all hours of the day and night. The students increased their presence after Madison teachers called in sick and the entire K-12 public school system was shut down. It has remained closed since Feb. 15. On Feb. 18 Milwaukee public schools shut down. 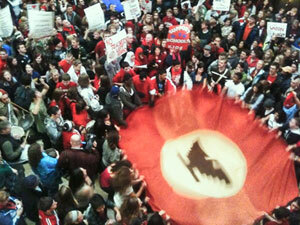 Many students from that district joined their teachers at the Capitol. Dozens of school districts in Wisconsin have either shut down entirely or been slowed down by teacher sick-outs. After threats of retaliatory action against some teachers, doctors began signing excuse slips at the Capitol on Feb. 19. Inside the Capitol, slogans such as “What’s disgusting: union busting” echo off the Rotunda walls. Food and beverages are being distributed by students and workers. Donations are being given directly or called into local restaurants so food can be delivered. Students and workers have been sleeping overnight at the Capitol since early in the week. A communications room is in operation and medical workers are assisting. The bonds of unity and solidarity keep spirits up and promote a deep sense of camaraderie. Signs such as “Egypt? Wisconsin?” convey the inspiration Wisconsin protesters got from the Egyptian people. Spirits are bolstered by artwork from other international struggles and signs from activists in the U.S. Large sheets of paper with colorful artwork are taped to the walls, and notable signs include “Zapata lives” and “Sí se puede.” Also visible are solidarity messages from Argentina, Mexico, Texas, Detroit, Baltimore, Boston, San Francisco, Raleigh, N.C., and others. “I think it’s great to see the crowds just building and building. We need to fight against this bill — it’s terrible. It was our fathers and mothers who built this, now it’s a whole younger generation, and it’s just wonderful to see,” Babette Grunow of Milwaukee told this writer. On Feb. 17 University of Wisconsin students walked out statewide. At UW-Milwaukee, the second-largest campus in the state university system, more than 3,000 students filled the main plaza for a rally sponsored by SDS and supported by the UWM Education Rights Campaign. Walker’s budget bill was stalled in the Joint Finance Committee after a people’s filibuster of more than 20 hours on Feb. 15-16. 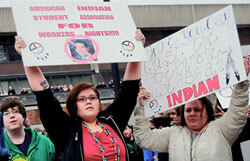 The Wisconsin AFL-CIO says that 20,000 descended on the Capitol Feb. 15 and 50,000 the next day. Delegations of firefighters joined the protests in a notable act of solidarity, as they are exempt from the dire effects of Walker’s bill. They received an electric response from the crowds, as have the youth and students. 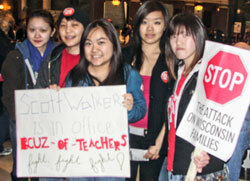 Statements and resolutions of support for Wisconsin workers and students have come in from across the country. The San Francisco Labor Council, the Tucson May 1st Coalition, United Electrical Workers Local 150, Black Workers for Justice, South Bronx Community Congress, Michigan Emergency Committee Against War and Injustice, Students for a Democratic Society, Fight Imperialism, Stand Together, Moratorium NOW! Coalition to Stop Foreclosures, Evictions & Utility Shutoffs, and scores of other unions, student and community organizations have pledged support. Bryan G. Pfeifer, a former Wisconsin resident, is presently staff organizer with the Union of Part-Time Faculty-AFT Local 477 at Wayne State University in Detroit, Mich.